Our faith diminishes because our ambitions are limitless. There is a small story for this. There was a rich person who had a daughter with a flat nose. The father wanted to get this girl married. Every person who came and looked at the girl used to go away, although they were tempted by the wealth. In those days, persons who could perform plastic surgery were not available. In desperation, he announced that he would give plenty of money to anyone who would marry the girl. He somehow found someone willing to marry her. 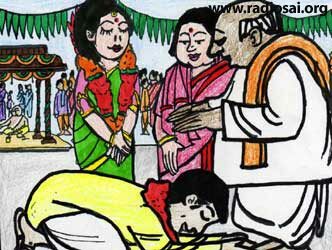 The marriage was performed and thereafter the couple developed considerable faith in God. They visited many temples, went on many pilgrimages and bathed in many sacred rivers. They met a saint who advised them that no one who is involved in worldly matters can give a good nose. Only He, who created the nose, can bring it back to normal. Although they had lots of wealth, they were not happy at all. The girl used to feel that others were looking at her and making fun. 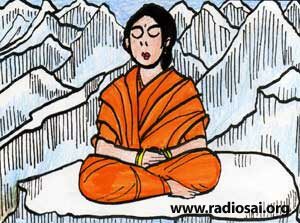 She suggested to her husband that they should both go to the lonely Himalayas and pray to God and spend a month there in that manner. He agreed and they did so. The girl had a great desire to get back her nose, so she began to pray to God in great earnestness. God appeared, due to her good luck and asked her what she wanted. 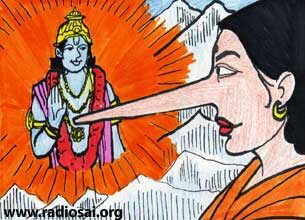 As soon as God appeared, she asked for the grant of a good looking big nose. God said, so it shall be and granted her the boon. As soon as God disappeared, she looked at her face. She looked at the big nose and felt that she had become uglier than before. She prayed again more earnestly and God appeared again and asked her what she wanted. She said that she did not want that big nose. God said, so it shall be and granted her the boon. She immediately found that her nose had completely disappeared. She had thought that she was praying to God for a good nose and in the process, she lost her nose completely. The moral of this story is that although God is present before you, playing with you and talking with you, you do not know what to ask, when to ask and where to ask. Not knowing what we should ask, we are asking him for one thing while really we want something else. In this process, we are getting ourselves into difficulties. God is always ready to give you all that you want, but you do not seem to know what is good for you and what you really want. Since you do not know what you should want and under what circumstances, it is better and easier to surrender yourself completely to God and simply ask for His grace.